From traditional country pastimes to modern games, Hatfield has played a part. This is just a sample of the sports and famous personalities known to have Hatfield connections. Queen Elizabeth I – having ascended the throne in Hatfield she moved her court to London, but is reported to have returned to Hatfield to take part in hunts. 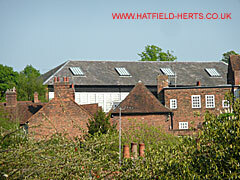 Hatfield Real Tennis Club – built in 1842, it is one of only 23 real tennis clubs in the world (its roof can be seen from the station and Salisbury Square – as shown in the photo above). King's Cup Air Races – the main British air race started in 1922, it was the first major aerial event to be held at Hatfield. Captain Geoffrey de Havilland won the first Hatfield based race in 1933, while a future Supermarine Spitfire test pilot Alex Henshaw won in 1938 – the last race before the outbreak of World War 2. London Aeroplane Club – was a hugely important social centre in the pre-war years. Apart from aviation activities, it also boasted a swimming pool, squash courts and international standard tennis courts – laid down by En Tout Cas, who had laid surfaces for Roland Garros and Queens. Freddie Titmus – Middlesex and England cricket all-rounder. Won 53 England caps over 19-years, including three Australia tours. Played county cricket between 1949-82. Ran a sweet shop at Manor Parade, Hatfield Garden Village in the Sixties. Iain Dowie – Queens Park Rangers football team player and later manager born in Hatfield. Also managed Coventry City and Crystal Palace. Rodney Marsh – Footballer, played for Fulham, Queens Park Rangers, Manchester City and Tampa Bay Rowdies. Later, manager and a contestant in I'm a Celebrity Get Me Out of Here (2007). Born in Hatfield but now resident in the US (perhaps purely coincidental but he was born the day after a V-1 flying bomb struck the town). Bob Wilson – former Arsenal and Scotland goalkeeper and TV presenter, along with his wife Megs, set up the Willow Foundation in Hatfield – Please see Charities. Hounddog Drag Racing Team – group of employees of SLD Olding (originally Jack Olding & Co; whose successor later sponsored the team) created one of Britain's most successful drag racing teams. Saracens Rugby Football Club – has its training headquarters above the de Havilland Sports Club in Hatfield. Hertfordshire Sports Village – operated by the University of Herfordshire on their de Havilland Campus, has been selected as a training venue for the 2012 London Olympic Games. Matthew Connolly – the Arsenal and Queens Park Rangers footballer lives in Hatfield, and opened his own business (a tattoo parlour) here in 2009.